When mp3s invaded the collective consciousness of our society, it gave birth to something no one had foreseen before. The availability of infinite music at the disposal of one’s fingertips. The key word here is “disposal”. Indeed, an instance of a file can be classified disposable commodity – the loss of a file inside an environment or system meant nothing as long as it could be replaced by an identical copy of itself prior to its loss. Of course to be disposable, a commodity must be replaceable easily without spending much resource (time, money, etc.). The threshold of what can be considered a disposable resource thus differs from person to person and from environment to environment. Prior to the smartphone era, The rampant (and often illegal) usage of file sharing systems ensured that such identical copies were actually made. In suburbs of India, internet wasn’t an accessible commodity yet. There were shops who specialised in downloading songs and burning them as mp3 data discs for consumption of the common man. The general public paid a small fee to these shops for their services. This firmly planted an illusion in their heads – that they were paying for the music. This illusion did have its benefits, though. The very act of giving up a bit of hard earned resource (in this case, money) in exchange for entertainment at least made music tad bit less “disposable”. With the advent of smartphones, the middlemen as well as the investment of money as a resource was done away with. So, what we were left with was disposable music, just like disposable napkins and disposable cutlery. In the above case, the money charged by these shops was already much lower than the disposable threshold of many affluent families. Thus, if I may say, music as a disposable commodity was already an idea that got implanted in the minds of the affluent first. Here is an article from a musician / record industry point of view that highlights the collateral damage that illegal downloading has caused. If you read the article, the problems listed there aren’t caused by illegal music per se but by the association of lesser value to music itself. When something is disposable, it is easy to hoard a substantial lot of such commodity. The resource requirements of mp3s in terms of storage space, bandwidth and financial investment (if procured illegally) is quite less. As a result, most people keep a library that is overflowing with music. There is only finite amount of time one can devote to the act of listening to music. In most cases, the listener is engaged in passive listening. i.e. using it as a background soundtrack to his daily chores. There is no harm in that. Occasionally, something unusual will peak the listener’s interest and will cause him to shift to active listening. This phenomenon is compounded if the music playlist is incoherent and long. When an artist knows that this is the primary way the majority will consume his music, he ends up creating the kind of music that can peak the listener’s interest even amidst chaos. Such feedback loop has given rise to the “hook” culture – where an artist strives hard to create the best hook possible. Hook based songs rarely have more than one or two movements, resulting in songs that are under four minutes and perfectly suited to those suffering from ADHD. Consequently, the number of artists working on coherent albums are becoming lesser day by day. As a listener we really need to introspect. Do we really need 128 GB of music at all times? The large quantity of disposable music merely distracts our focus. In the end no one ends up listening to that much of music. The instant availability of such a large amount of choice is merely another comforting scenario for most people. It is much better to carry a handful of albums – maybe five at most – and pay them the audience that they deserve. We have progressed to an interesting scenario. From a resource point of view neither money nor device and storage space is an issue any more. The former is solved by filesharing and the latter by the advent of smartphones. The only resource that music needs is the listener’s time. Sadly, most of us are in a position where allocating such kind of dedicated listening time is not our priority. There are two scenarios that can arise. Firstly, let’s take the case where the music is accessible, viz. as bad quality mp3s on smartphones. In that case, the ones that need some time to get used to are removed from the regular playlist in favour of those built around stronger “hooks”. It is similar to preferring a red dot on a white canvas over a muted but intricate watercolor piece. The former has its own story to tell. The latter one has one, too. 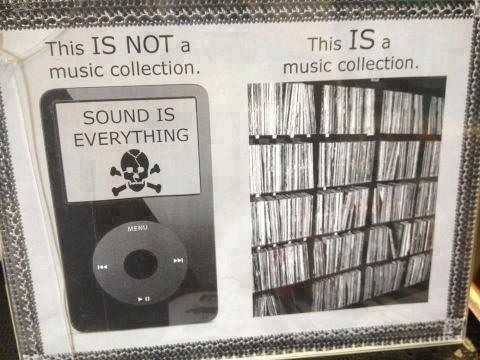 Secondly, let’s assume that the music is not easily accessible. It could be an obscure band that plays really well and are performing somewhere else. Maybe it is a four hour drive (if you are a Bangalorean, the band might play on the other side of the city and you might still not make it in five hours on a working day). We are now talking about a substantial resource investment – of both time and money. In most cases, people will prefer going for a well advertised, safer artist than spend such resource. It has become a general norm to try for free. Case in point are the live bands and DJs who perform in watering holes. People go there because there is very less overhead that one has to allocate to the music. If one finds the music not to their liking, the money isn’t an issue since they have not paid for music separately while time would merely be reallocated to the food and drinks. The resource allocation problem had been pointed out in an article on Maisonneuve. Vinyls, magnetic tapes and CDs are better forms of listening sources than any file residing on any computer (including a smartphone). They are better than music in hi-definition or lossless forms, too. The absence of something tangible makes it easy for us to categorise a piece of music into the aforementioned disposable category. In these cases physical space is also a resource. There are many advantages of listening to music from a hardcoded source but I will reserve the commentary for another blog post. For now, here is an interview of Richard Marx highlighting this issue. Needless to say, the impact of physical medium turns out to be different for the affluent and the poor since the threshold of indispensability is different for them.